These Christmas party games for kids are perfect for a school party or a family get together where there are going to be lots of kids. The best part about these Christmas party games is that they only use items that you already have. That means you don't have to go out and spend your hard earned cash on items you probably won't ever use again. Want to have some grown-up Christmas fun? Here's a list of Christmas party games just for the adults. If you're looking to save more money this holiday season, be sure to check out my Christmas freebies where you'll find freebies like free letters from Santa, printable Christmas gift tags, and much more. If you're looking for more Christmas games for kids? Check out my list of free online Christmas games that kids can play. The kids will love this Christmas party game where they race to recreate a stack of gifts. All you need is some empty boxes and leftover gift wrap. There's also a fun variation to this game where it's turned into a relay race. It's really a great overall game that kids of all ages will enjoy. Here's a fun idea for a Christmas party game for the kids that challenges them to toss jingle bells into colorful cups. You can easily modify this game for all ages of kids depending on how close you let them stand to the group of cups. You'll just need a few supplies for this Christmas party game for kids and you probably already have these on hand - white cups, construction paper, and some rolled up socks. Decorate each cup with a snowman face and then stack them in a tower. Kids will take turns throwing the rolled up socks to the tower to see how many snowmen they can knock over. Here you'll find the basic rules of charades and you can put a Christmas spin on it by making all the phrases about Christmas and the holiday season. Included is a free printable with quite a few ideas for Christmas charade clues. Just print it, cut the clues apart, and place in a container so someone can pick one. Kids love to decorate cookies and although it can be a messy activity, it's an easy one that the kids can jump right into. You can make the decorating even more fun by giving out awards for the prettiest, most creative, most colorful, and best tasting. Everyone's a winner though when they get to enjoy these sweet treats. Print out these printable bingo cards and you'll have an instant Christmas party game that didn't cost you anything. Bingo is a great game for kids of all ages and there's a wide selection of cards to choose from. Here's a fun scavenger hunt where the kids will need to find Santa's reindeer that you've hidden around the party space. Depending on the age of children you have at the party, you can make them easy to find or more difficult. The game asks you to use little reindeer figures but you can make it free by using a printable reindeer from my free Christmas coloring pages. 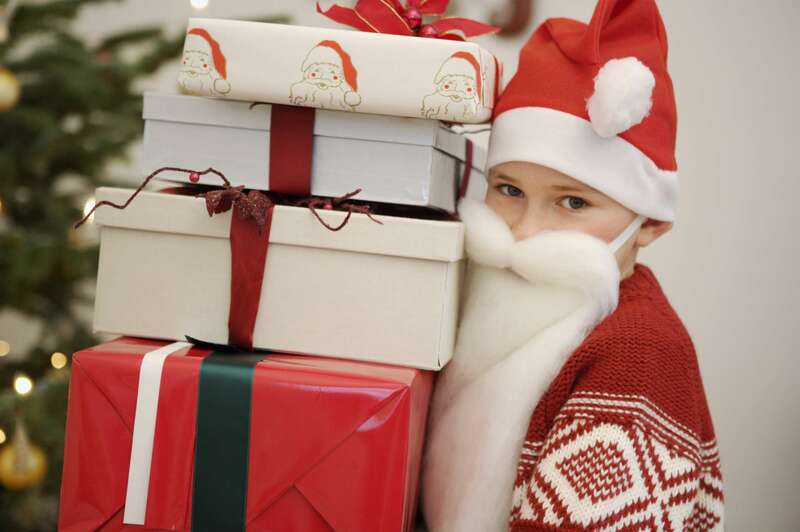 Fill a large stocking with items around the house and let the kids guess what's in the stocking. There are lots of ideas here what to put in the stocking, such as a pine cone or ornament, so that kids can feel the object through the stocking and make a good guess on what it is. This Christmas party game for kids will help keep their mind sharp as they try to recall items that were place before them. There are two more variations to this game, one has you ask specific questions about the items and the other one has you "trick" the kids into what exactly they were supposed to remember. 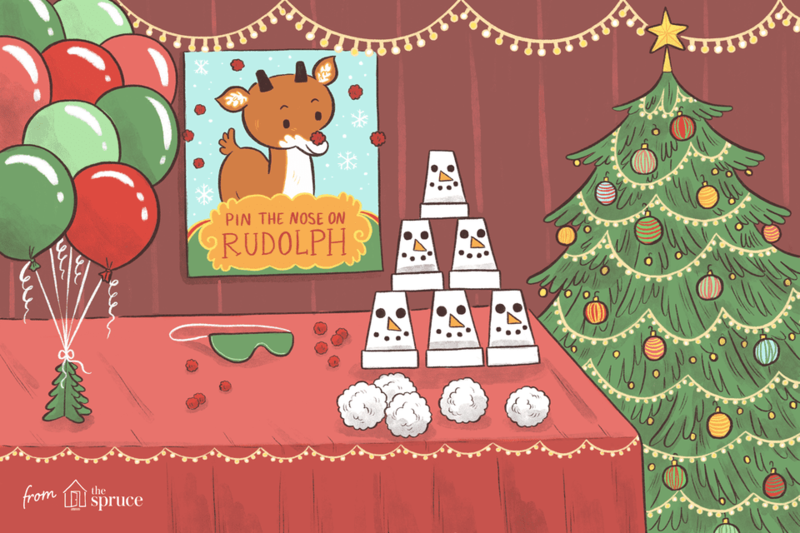 A silly take on the popular game that kids will absolutely love when they try to pin Rudolph's nose in the right place. Included in this game is the face and a whole bunch of noses so each child can have their turn. Santa Says is a fun take on Simon Says that's a great way to end a Christmas party for kids. Be sure to include things that Santa would do such as delivering presents, sliding down the chimney, and reading a Christmas wish list. Here's a great Christmas game for an active group of kids. This is a relay race where kids work on teams to unwrap and then rewrap gifts. You can change the gift wrapping complexity depending on the age of the kids. Here's another relay Christmas game for kids. Each child puts on a pair of mittens and then unwraps a small piece of candy while wearing them. This game can work with teams or keep the kids working on their own.